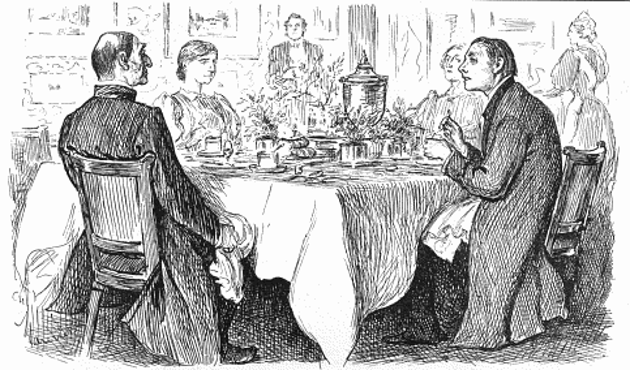 “True Humility” by George du Maurier, originally published in Punch, 9 November 1895. See the first part of this article. Every judgment of conscience, be it right or wrong, be it about things evil in themselves or morally indifferent, is obligatory, in such wise that he who acts against his conscience always sins. —St. Thomas Aquinas. III Quodlibet 27. I am wary of “I’m here from the Government and I’m here to help you.” Government bureaucracies, whatever may be their nominally altruistic purpose, suffer from the lack of competition, are beset by red tape, and are motivated primarily to increase their next appropriation. They are, in effect, dinosaurs that have not been eliminated by evolution. I’m wary of rules that might be set by international bureaucrats, who have no experience of the democratic way of life or what the free market can accomplish. Catholic apologist Patrick Madrid says, “the pope [sic] is not infallible when it comes to science, politics…” Accordingly, as faithful Catholics we are enjoined to consider prayerfully and carefully pronouncements of our Holy Father which are directed to political and economic policies, but we are not obliged to follow them, if they do not directly involve matters of morals or faith or if we honestly believe they will not effect a moral good. Disentangling moral and faith issues from political and economic policies is not an easy task. I discussed this matter with our priest, and he brought up the question of abortion—certainly government policies on abortion should not violate Catholic moral precepts. Nevertheless, many eminent Catholics (for example the famed Catholic legal scholar, Douglas Kmiec, and the Jesuit Editor of America) supported pro-abortion candidates for president. Can their example be followed, so that one selects which Catholic precepts enter into one’s policy choices, presumably justifying choices by some sort of “Double Effect Doctrine“? I think not. Well, let’s see what Pope Francis has to say about desired political and economic means, either national or supra-national, to bring about the goals of the Encyclical. Inequity affects not only individuals but entire countries; it compels us to consider an ethics of international relations. A true “ecological debt” exists, particularly between the global north and south, connected to commercial imbalance…The warming caused by huge consumption on the part of some rich countries has repercussions on the poorest areas of the world, especially Africa, where a rise in temperature, together with drought, has proved devastating for farming. [emphasis added] #51. Is the emphasized statement verified or verifiable in any sense, either premise or conclusion? And which supranational agency is to decide on the amount of the debt, the amount of energy limitation and the amount of support? Is this legal framework to be an international code, superseding national laws? What does “universal” mean? In the Acts of the Apostles, private property was subordinated to the community. In monastic orders, private property is subordinated to the monastic community. What might be “distributive justice”? And who is to make that plan and enforce it? Again, what if a consensus cannot be reached? As the bishops of Bolivia have stated, “the countries which have benefited from a high degree of industrialization, at the cost of enormous emissions of greenhouse gases, have a greater responsibility for providing a solution to the problems they have caused”. #170 quoting from the Bolivian Bishops’ Conference, 2012. Where is it proven that greenhouse gases have caused a problem? Such as replacing incandescent light bulbs by fluorescent, which are hard on the eyes and hazardous when broken? Who is to establish these risks and benefits–the Pontifical Council for Justice and Peace, the UN or…? The bold-face statement is that which I find most disturbing. In the face of all else that is said in the Encyclical, this statement seems to be no more than a token, an ambiguous admission that some parts of the Encyclical may be based on false scientific premises. Here too, it should always be kept in mind that “environmental protection cannot be assured solely on the basis of financial calculations of costs and benefits. The environment is one of those goods that cannot be adequately safeguarded or promoted by market forces”. Once more, we need to reject a magical conception of the market. #190 Quote from Pontifical Council for Justice and Peace. Does this not show a bias against capitalism and the free market? For new models of progress to arise, there is a need to change “models of global development”;this will entail a responsible reflection on “the meaning of the economy and its goals with an eye to correcting its malfunctions and misapplications”. #194 quotes from Message for 2010 World Day of Peace. The quotes and other parts of the Encyclical not quoted show a bias against capitalism and a bias for international government control. This bias for state control is, in my opinion, naive. It ignores the fact that the worst pollution and scarring of the earth has occurred in governments which are most authoritarian–the USSR and Russia, China, Zimbabwe—rather than in the free, capitalist nations. Whether Pope Francis’s apparent bias for state and international control is part of the general culture of the South American hierarchy and the Argentinean Jesuit Order, or engendered by Pope Francis’s Argentinean background, is a question I’m not equipped to answer, but it’s clear that it is there. Pope Francis also seems disposed to accept as fact the false assertions of radical environmental organizations. Editor’s note: Don’t forget to visit Reflections of a Catholic Scientist. Inequality is a fact of nature. All collections and groupings have inequality. Capitalism is an expression of human nature that addresses the effects of inequality by providing the most efficient and fair means of compensating for important inequalities. Ignoring these truths leads to mischief. The encyclical is a mischief-maker. Bob: I do love that quote from your wife! It is interesting to note that the “rich” countries are all drowning in debt. Greece, Puerto Rico, etc. China’s stock market crashed. So where does the Pope plan on getting the money from, or is he advocating we print money and hand out as if it were “real”. Perhaps he wants no money at all–just let the illegals in and give them handouts. Funny, no where in the Bible was charity ever mandatory or administered by the government. No where was private property declared wrong–in fact, I think that’s why Jesus was born in a stable. Something about property taxes…..Acts of the Apostles appears to be voluntary subordinating within a small Christian group. Consensus can always be reached, even if by force and killing of all opponents. There is complete consensus in North Korea. LED bulbs are the new way to go. I’m sure they’ll prove to last 20 years as promised. “lack of full scientific certainty shall not be used as a pretext for postponing cost-effective measures” A call to follow Chicken Little. as an absent-minded scientist I occasionally put an uncapped pen into my shirt-pocket. Although the stain is small, it can’t readily be removed, and ruins the whole shirt. Here’s the ratio for the analogy (folks reading the comment didn’t get it): shirt: Laudato Si :: stain: Pope Francis’s reliance on false climate science claims. PS …I’m still not certain whether the analogy holds for the encyclical. “Dante’s Inferno”, by Larry Niven and Jerry Pournelle. In circle 9, the place for traitors, Niven and Pournelle had senators voting opposite sides on an issue both in that circle. They asked the protagonist, which of them had voted correctly- since they had opposing votes, they shouldn’t BOTH be there. The protagonist responded with the same argument as Thomas Aquinas. Both senators had voted with their party and aginst their own conscience, so they were both traitors to the U.S.
Sheri: I’m pretty easy-going, but I’m getting real tired of stupid assertions being assumed true. My assertions here are authenticated by several millennia of history. And you are correct about the earliest churches described in the Acts of the Apostles (Chpt. 2 and 4). The gifts were voluntary; the motivation was love, not mandate or coercion. The widows and orphans were supported because circumstances beyond their control made them economically unequal, not because some leader dreamed up a welfare program. The leaders only came into the situation when the number of adherents grew large and cultural problems arose between those of Hellanistic and Hebraic backgrounds (Chpt. 6). So they appointed a committee with members from both groups to handle administration. The proposal “pleased the whole group.” What? A real consensus! Gary: Maybe I should have gone with a winking emoticon? I thought the smiley and the excalamation point would get across the nature of my comment, but apparently not. Bob’s second piece on Laudato Si prompts some reflections. Especially troubling are encyclicals such as Laudato Si, which clearly are efforts to teach on specific matters of (faith and) morals, yet have the kinds of defects Bob is pointing to. Such encyclicals are grist for the mills of all, ‘Catholic’ or no, who think that the Catholic Church is just Making It All Up. It’s harder to disagree with this view, when even faithful Catholics like Bob also in effect are saying (that for this encyclical), the Sacred Pontiff is just Making (a lot of it) Up. However, I am strangely reassured by the fact that even Catholic bishops, including the present Pontiff, are evidently not well-schooled enough in Latin to be able to use Latin to reliably communicate with each other. For that is what they were most solemnly enjoined to be able to do. Steve Skojec at One Peter Five writes that “an apostolic constitution is the most authoritative form of papal document.” It’s binding on the entire Church. It’s more authoritative than an encyclical (Laudato Si is an encyclical). A ‘constitution’ is meant to found (constitute) the Church in some respect. As is laid down in Canon Law (can. 1364) or commanded by Our Predecessors, before Church students [JohnK: that is, seminarians] begin their ecclesiastical studies proper [JohnK: as official seminarians] they shall be given a sufficiently lengthy course of instruction in Latin by highly competent masters, following a method designed to teach them the language with the utmost accuracy. … We wish the same rule to apply to those whom God calls to the priesthood at a more advanced age, and whose classical studies have either been neglected or conducted too superficially. No one is to be admitted to the study of philosophy or theology [JohnK: in context, this again refers to seminarians, for ‘philosophy and theology’ are considered the principal studies of the soon-to-be-a-priest seminarian] except he be thoroughly grounded in this language and capable of using it. Both the present and in-force Canon 1364 and the most recent and authoritative papal statement on the subject say the same thing. And pretty much everybody has ignored it, or honored it only in the breach. Very few priests and bishops are competent enough in Latin to be able to use it as the universal language of the Catholic Church — to communicate reliably across all linguistic and national bounds. It is almost with amusement that I state the obvious: this constitutes self-evidently clear and well-nigh universal violation of present Canon Law, and of really-authoritative papal direction, by Catholic bishops themselves, coupled with a lack of consequences for doing so (which is the fault of a series of reigning pontiffs). And nobody in the Catholic Church’s hierarchy is even apologizing for it. Even the present Pope’s Latin in fact seems pretty shaky — he himself doesn’t seem to meet the standard of Canon 1364. If Canon Law and apostolic constitutions are routinely ignored by the bishops themselves, why should we be especially neuralgic about a mere encyclical, especially since encyclicals are (to be frank) a dime a dozen? Encyclicals, compared to some current Weltanschaung, may look darned good at times. But compared to the One Sacrifice offered at every Mass in the Catholic Church throughout the world, encyclicals are a pretty flimsy reed. Put differently, the presence or absence of an encyclical is not the end of the world. The End Of The World is the end of the world, and its sole remedy in this life is the Mass, and the other of the seven sacraments. These particular physical-acts-in-time have universal, decisive, and PERSONAL spiritual significance. Jesus is Lord, and he continues his salvific work in time especially through these. This is our faith. The Eucharist is the Medicine of Immortality — not by symbol or idea, but in itself, in fact. We are beginning to understand (compelled to understand, from bad example) that an encyclical, by contrast, may be a good idea, or mostly a bad idea. And that we have to weigh, and choose, because encyclicals, unlike the sacraments , can be unreliable. Isn’t that also exactly whom we started with, some 2000 years ago? I do like your analogy about the ink on the pocket. The analogy even allows for some scientist/engineers who aren’t aware of or don’t care about their appearance. There are going to be Catholics who are unaware of the “stain” and will accept the Encyclical as is. There are going to be Catholics who are aware of the “stain” but for whatever reason don’t care and will accept the Encyclical as is. Then there are Catholics who will be conflicted about the Encyclical because of the “stain” and may “wear” the shirt if none other are available. Then there are Catholics who can chuck the whole thing the trash. This may not be true, see Arts 5.1-11. John B() … I like your followthrough on the stained-shirt analogy. I’m of your penultimate category: I’ll wear the shirt for working in the garden, but not for dress, unless I have a coat to cover the stained pocket. I have never read this as being a mandatory donation problem. The problem was they both LIED about how much they sold the land for. It does not address whether or not they could have kept part of the proceeds had they requested to do so and whether or not their membership in this group of Christians was anything other than voluntary. In other words, it seems likely they knew the rules and chose to lie to God about how much money they made. That was the reason they both died. 32 All the believers were one in heart and mind. No one claimed that any of their possessions was their own, but they shared everything they had. 33 With great power the apostles continued to testify to the resurrection of the Lord Jesus. And God’s grace was so powerfully at work in them all 34 that there were no needy persons among them. For from time to time those who owned land or houses sold them, brought the money from the sales 35 and put it at the apostles’ feet, and it was distributed to anyone who had need. 36 Joseph, a Levite from Cyprus, whom the apostles called Barnabas (which means “son of encouragement”), 37 sold a field he owned and brought the money and put it at the apostles’ feet. Nothing indicates these donations were anything but voluntary. It suggests that there may be Catholics who throw their hands up and chuck more than the shirt. Sheri, to save your interpretation you must assume that lying is worthy of the death penalty. Is this really what you want to claim? You also add what is not there, which is that they could have asked to keep some of the money. The real purpose of this parable is the last line “And great fear came upon the whole church and upon all who heard of these things.” It is meant as a message to others. If this is not rule by fear and coercion then nothing is. “Nothing indicates these donations were anything but voluntary.” Acts 5.1-11 is nothing? To me it shows how the consensus was enforced, otherwise why mention it at all? This is why I find the Bible difficult at times. Also when you and Gary made your claim why was it left to me to bring up this point? Why would you not have included it yourself, if only an exception that proves the rule sort of claim? Maybe you find it upsetting as well. Sheri: I got it. Just being cranky, I guess. Scotian: You’re straining at gnats. 1) God imposed the penalty, not Peter. 2) The penalty clearly was for deception, not for keeping some of the profit. 3) The charitable acts began before this episode, not because of it. 4) Fear came at the realization that deliberately disobeying God’s standards could have severe results. 5) The charity continued (see Ch 6:1). As for not mentioning it before, it didn’t illustrate the original point. But thanks for bringing it up because it demonstrates that true charity comes from a willing heart and not from fear of retribution. Don’t you know God loves a cheerful giver? From His point of view it’s mostly about a social/spiritual relationship, and much less about nutrition and physiology. Scotian: Lying to God is worthy of death. God’s rule, not mine. It was very clearly stated this was about lying to God, not lying to other people. Actually, all sin is grounds for death. That’s why Christ was sent. The first humans were disobedient and were sentenced to die, via being removed from the garden before they could eat from the tree of life. So, yes, lying to God and in a round about way, lying in general, are grounds for death. I have never claimed God does not rule by fear and coercion. There is plenty of Old Testament examples, and, as in this case, some New Testament. The incident is mentioned because they lying to God is a very bad choice. I don’t see why that is so difficult to understand. Perhaps you are reading more into this than is actually there. I just don’t see the problem. I didn’t mention it because I don’t see this as proof the donations were involuntary. Lying to God was the problem. Acts 4 says ““From time to time, those who owned land or houses sold them, brought the money from the sales and put it at the apostles’ feet.” This would indicate that ownership of property was most certainly allowed and selling was only from time to time. That doesn’t sound like the selling or the donations were mandatory. Again, I don’t this as being any kind of contradiction to people being allowed to own property. Otherwise, I would have mentioned it. I don’t find it upsetting, though if I planned on lying to God, I would find it upsetting. Gary: Okay. We’re all entitled to be cranky now and then. I’ll try to avoid adding to the problem. Sheri and Gary, actually the Catholics give a better explanation. Scotian: If that makes sense to you and helps you understand, go with it. The best parts of Laudato Si are the spaces between the words. Sheri, I wouldn’t go that far. 😉 I have presented something for people to think about and have no further interest in debating the issue. With power to enforce rules for peace…. When I hear bs like that, I really wonder if the writer understands what he is saying. What if one or more parties refuse the rules, period? Shall the rules then be enforced by guns and bayonets? If not, what good are the rules? If so, then you have a bs, false ‘peace’ that only hooks do long as people are held at gunpoint.